When you get an invite to visit a hop farm that tells us that they are doing something different to everyone else we were instantly interested to go pay them a visit. 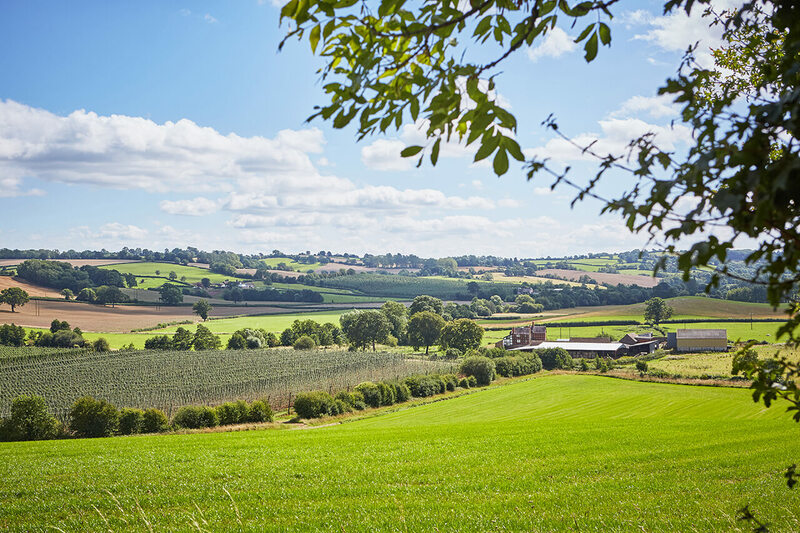 Brook House Farm is set in the Herefordshire countryside, a place where you will find many hop farms, and also lots of hops growing wild in the hedgerows at the right time of year. 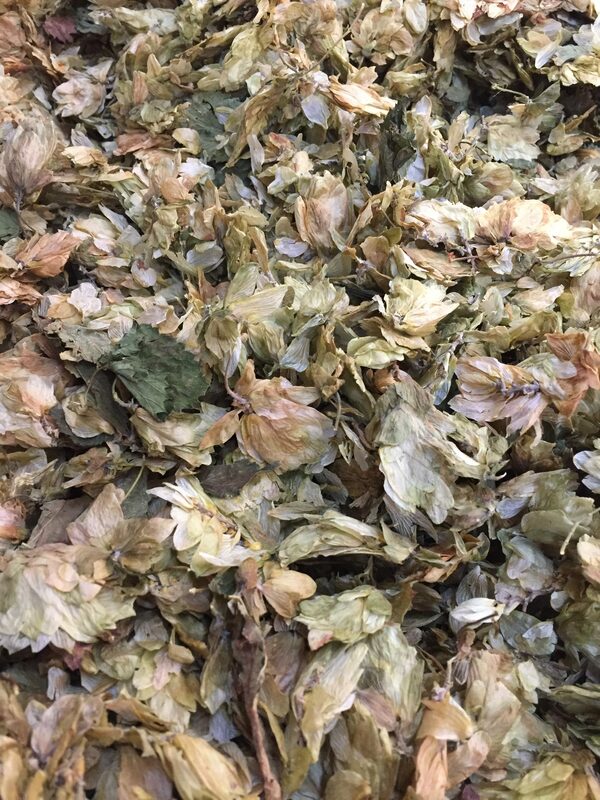 We took the drive up just at the right time of year, the hop harvest time of year. When we arrived there were tractors all over the place bringing in the harvest for processing from not only their own farm but also many of the surrounding farms. So what makes this farm different from the others? The first thing was that even after our high temp and dry summer the crop here was bountiful, large plants with large cones, all because just like you would see in the state of the art hop farms in Yakima over in the US these guys have invested in irrigation for the fields. 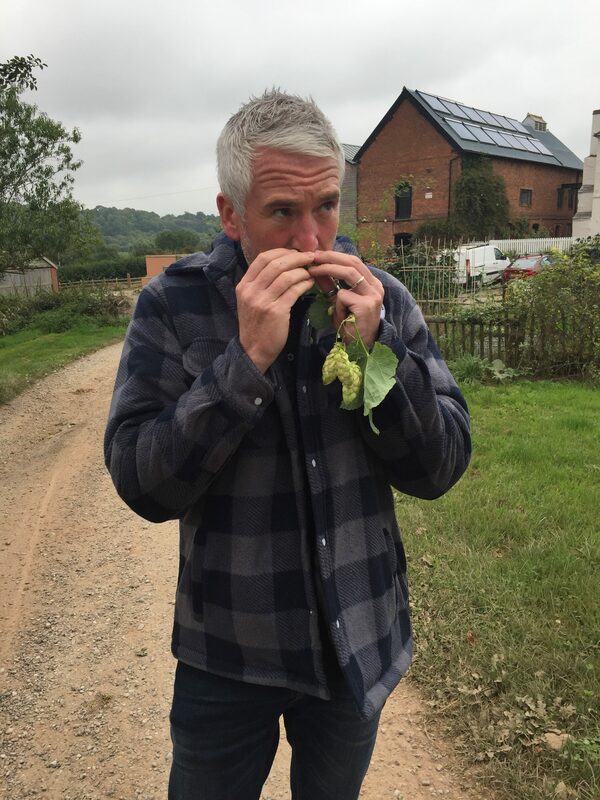 So even when we get that rarity of a long, dry, hot summer in the UK their crop doesn’t suffer in volume and quality. 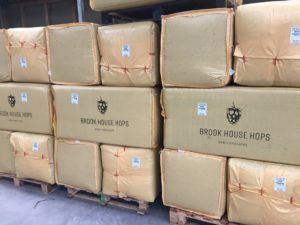 The hops don’t have to travel far from the field as all of the processing is done at Brook House Farm. 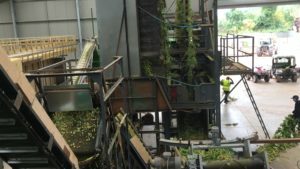 The first stage is when the hop cones are stripped from the bine. 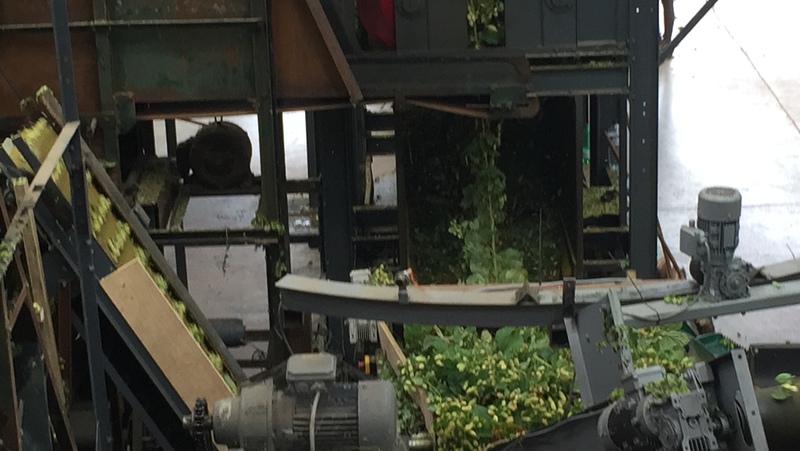 In the past this has been a difficult task to achieve with the historic equipment you would usually find in the UK, and its not uncommon for us to find 500g of bine stems, and the strings that the plants were growing up mixed in with the 5kg bale. 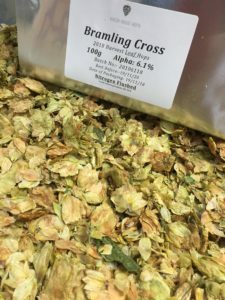 Sorting through a 5kg bag of UK grown hops really isn’t one of our favourite past times, and if you miss any of the wood bits this can lead to the 100g bags bursting and oxygen getting in the bag, so we were hopeful that these guys could help us to get something better. Once the bine has been hung up and passed though the first process which removes the main part of the plant and the string that they were once growing up. 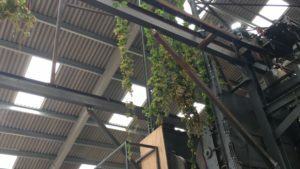 All of the material which is harvested (hop cones and leaves) are conveyed into a kind of wind tunnel. The wind blows the leaves out onto a waste conveyor while the hop cones which are denser fall onto a different conveyor which is destined for the kiln. 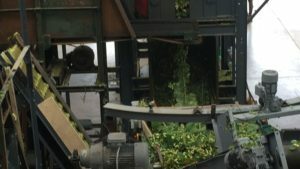 After getting onto this conveyor, the hops are dropped onto further conveyors which are constantly running up hill – a bit like the travelator at the end of ‘Gladiator’. 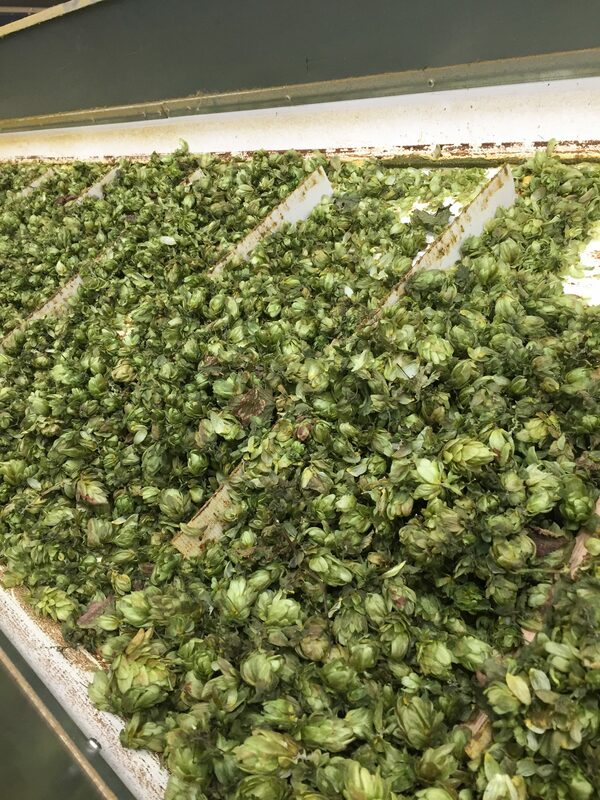 Hop cones will bounce or roll down these conveyors, while leaves (which don’t bounce) stick to the conveyor, and are sent back out to the waste. 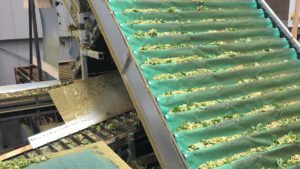 Finally they have a team of two or three people who stand over the conveyor on the way into the kiln whose job is to manually pick out leaves from the flow. 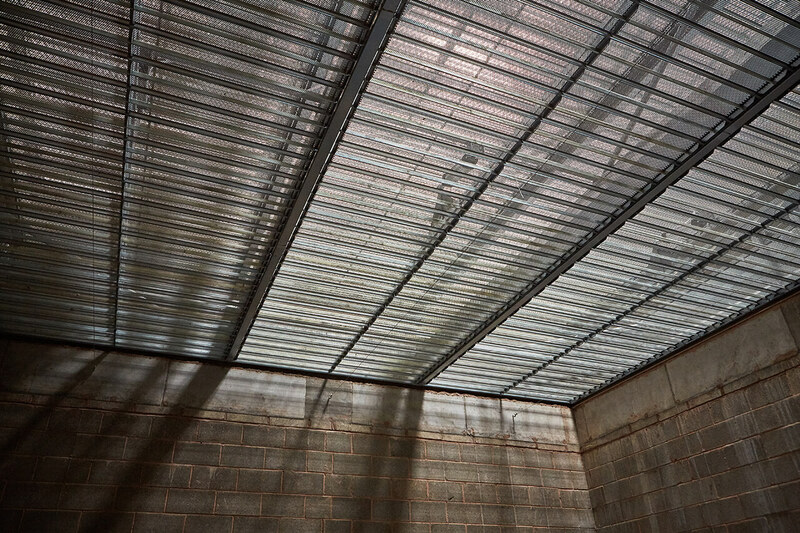 Occasionally you get leaves which manage to get through these screens – but they shouldn’t be as concentrated as they appear to be in this photo. 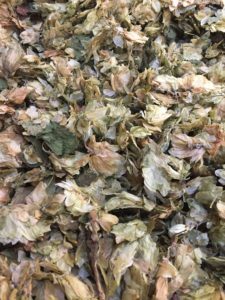 From experience the leaves are chemically very neutral – there shouldn’t be any influence on the flavour of the brew as there are no oils or other compounds which could give rise to other aromas in the leaves. 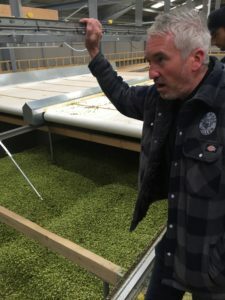 It is more an aesthetic issue, as well as an issue with the actual weight of ‘pure’ hops in a given weight of hops and leaves. 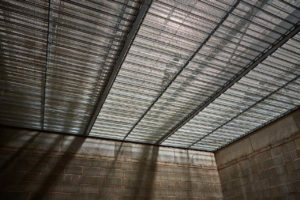 The drying kiln is more like a large insulated room, where the hops are held in a large wire draw, there are 4 draws of hops, and they rotate from the bottom of the kiln to the top so, as one draw is done the ones beneath it move up to be replaced by a fresh draw of newly harvested cones. This state of the art kiln which is all computer controlled is unlike any other in the UK, with its indirect heat source coming from gas to avoid the more traditional diesel powered which can sometimes impart its fumes on the delicate hops if used incorrectly. This really is all about protecting the precious harvest and to maximise the quality. The process takes 4 hours to take the hop from field to finished dried cone, whilst also ensuring there is a consistent moisture content maintained in the end product. 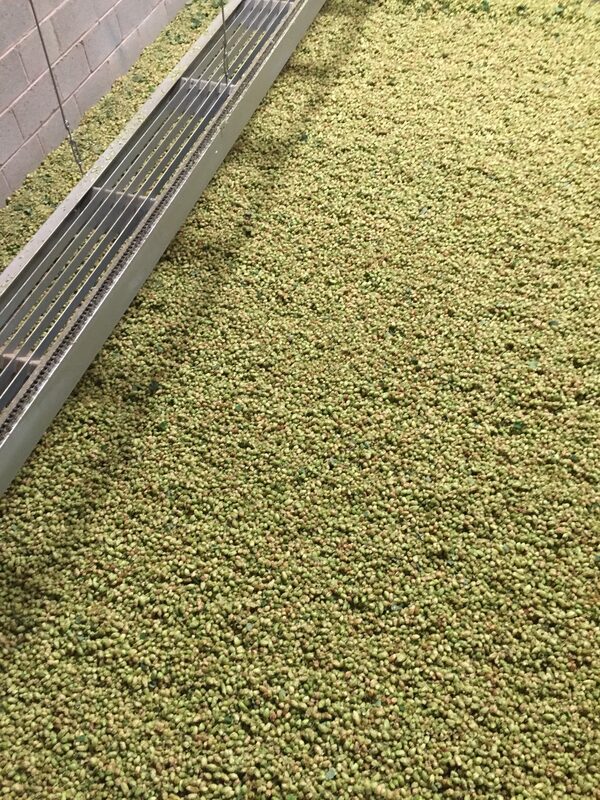 Once dried the hops then get transferred to what you can only call a giant temptation to dive into swimming pool of hops. The smell and aroma is just as you would expect from something big and fruity from the US, the quality really does shine thanks to the care and attention these guys take and of course from the investment in the latest state of the art facilities they are using, which are truly on parr with what you get to see in the US. 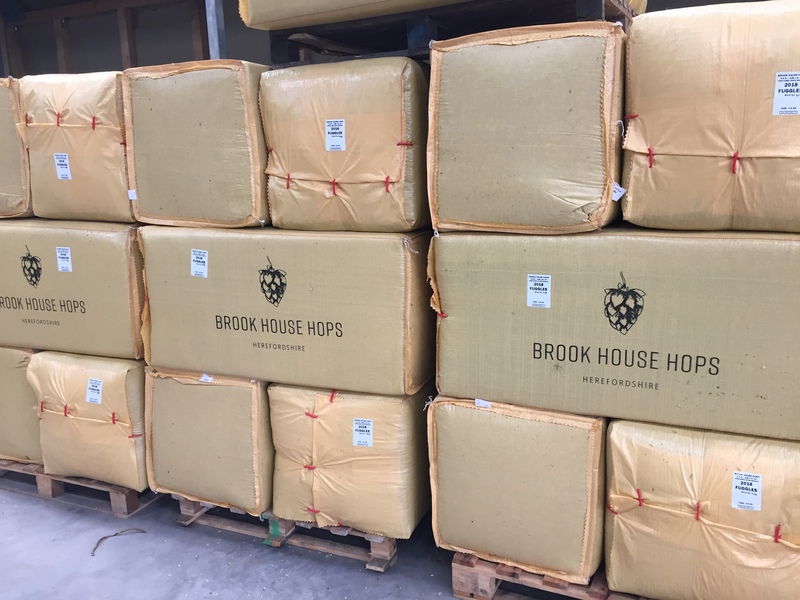 All thats then left to do is to package them up into giant bales of fresh hoppy goodness. The majority of which gets shipped over to the US, largely because they love our traditional British hops, especially when they’re this good. 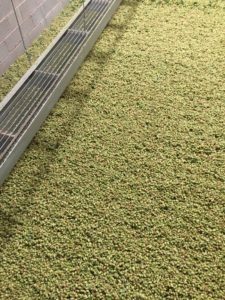 But this year we got in before it was all allocated and have secured stock from the 2018 harvest in the form of whole cones and pellets which were also processed and produced all at Brook House Farm. Of course though you don’t have to buy a giant bale when you buy them from us, you get our nitrogen back flushed 100g bags which we store in our cold room until they go into your orders.